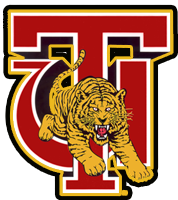 The Tuskegee Golden Tigers finished the regular season 8-2. The Golden Tigers finished second in the Western Division of the Southern Intercollegiate Athletic Conference, gaining an at-large bid into the NCAA Division-II playoffs. In the first round of the playoffs, Tuskegee took on No. 25 Catawba. The Golden Tigers jumped in front in this contest with two quick first-quarter touchdowns. Kevin Lacey’s 39-yard touchdown pass to Peyton Ramzy got the scoring going, and Jerome Lewis scored from two-yards out to extend the lead to 14. Cat-U was not done however, scoring the next 10 points to cut the deficit to just four. However, a 12-yard touchdown pass by Lacey followed by a 45-yard interception return by Jewell Ratliff extended the lead back to 16. A late score made it a 10-point game, but Tuskegee held on to win, 26-16. In their second round matchup the Golden Tigers took on No. 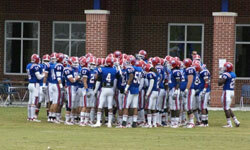 14 ranked North Alabama. This was an incredible contest that saw the lead change seven times in the game before Tuskegee finally pulled out the 35-31 victory. The Golden Tigers scored four touchdowns on the ground on their way to the win. Lacey struggled, throwing four interceptions. Dennis Norfleet carried the load for the offense, rushing for 136-yards and two scores. The defense got 12-tackles and 2-sacks from Julian Morgan. 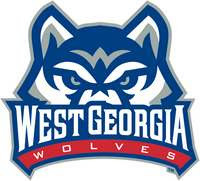 The West Georgia Wolves won the Gulf South Conference after going 10-1 during the regular season. The Wolves were an incredible offensive juggernaut, scoring less than 30 points on only two occasions, which included back-to-back games where they scored 57 and 56 points. West Georgia received a first round bye in the NCAA Division-II football playoffs, but then took on No. 17 ranked Valdosta State. The Wolves lead nearly the entire game, jumping out to a 10-0 lead a little over five minutes into the second quarter. Valdosta State battled back, however, and eventually jumped on top 20-19 with just 5:35 left in the game. Dallas Dickey brought home the victory with a nine-yard run to make it 27-20 and the Wolves advanced. Devontae Jackson ran for 120-yards and a score. QB Dallas Dickey had a tough afternoon throwing the ball, completing just eight of his 19-passes, but he rushed for 100-yards and the game winning touchdown. Kevin Lacey is an adequate quarterback at best and can be a real liability. He completed just 44.3 percent of his passes so far this season for 1,859-yards and 14-touchdowns. Lacey has thrown 11-interceptoins, and needs to have an outstanding performance if the Golden Tigers are going to advance. Dennis Norfleet is an impressive runner, who gained 800-yards on just 104-carries, an impressive 7.2 yards per carry average. He is the guy who carries a majority of the load, but others will give him some rest and can move the ball on the ground effectively. Jewell Ratliff just seems to be everywhere. He has 137-tackles, 2.5-sacks and 5-interceptions. He is a real force out there who gets into plays, and is not afraid to make tackles in the open field. Dallas Dickey may have struggled a bit in the matchup against Valdosta State, but this young man is the real deal. The West Georgia QB completed 62.1 percent of his passes so far for 1,721-yards and 17-touchdowns. He has also rushed for 529-yards and 4 more scores. He is an incredibly dynamic quarterback who can do a lot of things to help his team win. Devontae Jackson is a power runner who has speed to get away in the open field. He has gained 975-yards and 7 TDs, with an impressive 7.2 yards per carry average. Dylan Donahue leads the defense and he is a load. With 11 sacks, the junior defensive lineman is relentless in his pursuit of the quarterback. He should make this game a nightmare for Lacey. Outlook: There is a lot to like about the Tuskegee Golden Tigers, but the play of Lacey is a concern. He simply has to be at his best to beat the West Georgia Wolves who reached last year’s semi-finals round. Dickey is too much for the Golden Tigers to try to contain. Take West Georgia, 35-17.